ON BACK ORDER. Order now to lock in the Sale Price for late-April shipment. This Best-in-Class Countertop Home Water Distiller comes with a Break-Resistant, Food-Grade, (BPA-Free), Polypropylene Collection/Serving Pitcher, (Carafe). 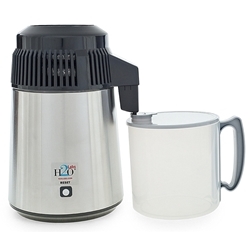 It has a Stainless Steel main body exterior and 100% Stainless Steel interior steam chamber and condensing coil and also features single-button start, automatically turns off, and is very easy to clean. Our Best-in-Class Models 100, 100SS, 300 and 300SS are identical except for your choice of exterior, White Baked-Enamel metal body or Stainless Steel body; and the collection/serving pitcher, (carafe), which is Break-Resistant Food-Grade BPA-Free Polypropylene with the Model 100 and 100SS; or a specially designed Glass Carafe and glass nozzle insert with the Model 300 and 300SS. Other than those variations, Models 100, 100SS, 300 and 300SS all share the same top quality features of our tried and true system that has been sold to thousands of satisfied customers. We have had this distiller for 2 1/2 years. We have made 2 to 3 gallons of distilled water every day. It is a well made product that stands up to heavy use. I will never go back to tap water. We are looking forward to upgrading to a higher capacity distiller. This one gallom distiller is worth every penny we spent on it. With electricity and carbon filters it costs us about 30 cents/ gallon. Purchased this unit in Feb 2016. I used distilled water to drink(Health wise). Average of 1.59 per gallon. Have kept count of water distilled, just totaled 584 gal to date. DO THE MATH Got my wife to using distilled water (never used to drink much) Now we enjoy our coffee better and she loves her lemon water more. Machine is very easy to operate, clean, and enjoy. 100% sastisfied. We are very please with our purchase of the 100SS Water Distiller. It comes as advertised; quality and performance - most refreshing. Thank you H2O Labs. We are very happy with this product! It is easy to operate and clean. It makes great tasting, pure water. This distiller will pay for it's self after about two months of use. We now make all the water we need and no longer have the hassle of lugging gallons home from the store or running out. Also, I had contact with customer service regarding a question, and the experience was great. I would recommend this product to anyone .... Thank you!